It baffles me that many people will eat chicken but not rabbit. Perhaps if the cuteness factor of chicks remained into adulthood poor poultry would have more of a chance against bunny. As for me, I’m game for game. A lot of invitations to dine out cross my desk these day (hope this doesn’t sound too self-important) and I refuse most of them. Unless they contain something that really excites me (and motivating to write about), for instance learning something about a new cooking method or cuisine, I can’t think that you will want to read about me sitting down for a nice meal. There are plenty of restaurant review sites that do a great job and it’s hard to be objective when you haven’t paid for your lunch or dinner with your own hard cash. When I do go out, I want to enjoy the experience without wielding my camera and making notes (although I do confess to meeting other criteria of food-nerdism). However, an invitation to The Cavendish restaurant at Bonnington Tower for a game-themed set menu matched with wines twisted my arm. 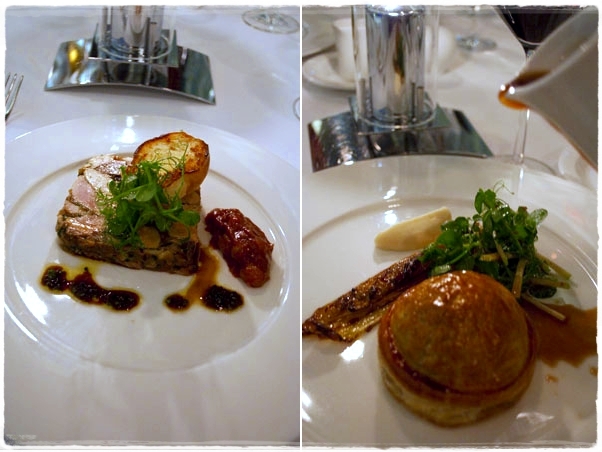 I’ll be honest, it was the wine and food matching that tempted me (still keeping my WSET 3 skills honed). Feeling intrepid as we were braving the unknown depths of Jumeirah Lakes Towers, a newer area of Dubai which remains a bit of a mystery, the taxi driver took us in through a new road to a gleaming, but fairly characterless hotel. With the jaded gaze of a long-term resident in Dubai, my heart sank at acres of marble and fountains as we descended the stairs into The Cavendish. I thought I knew exactly what to expect from the food. We were welcomed by Bernd Zeithen, (F & B Assistant Manager) who was attentive all evening, asking us for feedback on the food and the wine matches with genuine interest. He paid the same attention to the other tables of diners too. 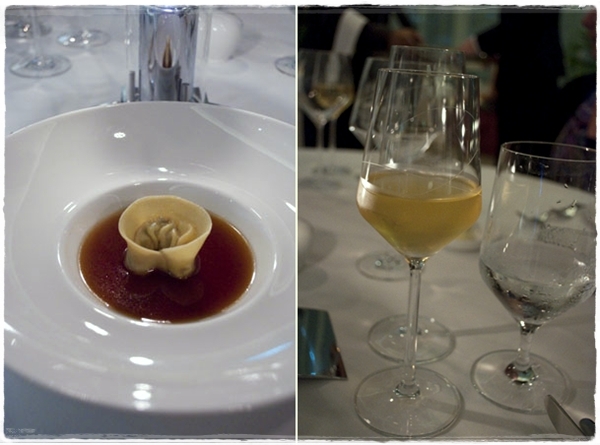 With a crisp, creamy glass of bubbles in the form of Graeme Beck Non Vintage Brut from the Western Cape, we were presented with a single tortellino containing confit of duck, truffle and herbs surrounded by a pool exquisitely balanced pheasant consommé. I sat up, swallowed every last drop of the deeply savoury liquid and silently digested my words and preconceptions. A stained glass window of game bird and foie gras terrine (described as a mosaic) held together with silky jelly making a great foil for the paté was matched with 2005 Weingut Max Ferd. Richter Wehlener Sonnenuhr Riesling Kabinett. Straw coloured with petrol and dried apricots on the nose, its oily mouthfeel and pleasant acidity adding another piece in the jigsaw of exciting textures and flavours. Very few people can resist a pie and I’m certainly not one of them. I was totally seduced by the dome of golden pastry cloaking roast quail and wild mushroom. It was elegant enough to earn it’s title of pithivier but satisfying enough for any comfort food lover (raises hand) especially as served with a jug of jus (gravy). A robust 2006 Syrah Viognier from the Western Cape by Porcupine Ridge was perfect; floral aromas of the Viognier complementing the herbs of the dish as did the spice of the Syrah with the quail. 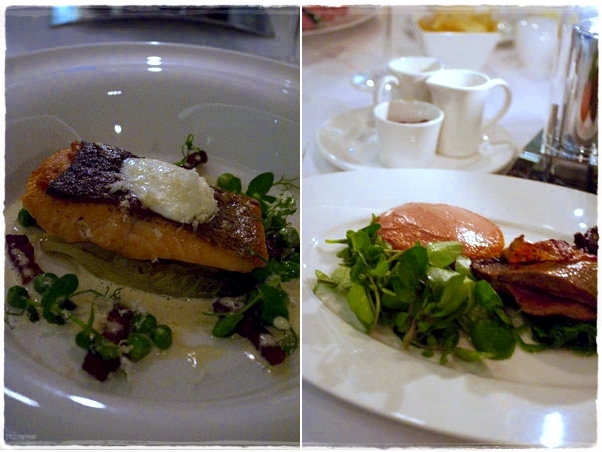 Pan-fried fillet of sea trout with braised baby gem lettuce, fresh peas, wild boar bacon and horseradish cream was an excellent dish but too subtle to be served after such a show-stopper. We also went backwards to a white wine match a Gewurtztraminer from Alsace by Hugel et Fils which although aromatic and fairly complex with tropical fruits such as lychee on the palate would have been more enjoyable before the beefy red. Grouse offers rich, coarse meat but like many game birds has a tendency to dry out. Despite its bacon overcoat we struggled to free much tender flesh from the bones. A watercress salad, game chips and toast spread with grouse liver pate redeemed the dish however and got me wondering where the chef had learnt his trade. A 2004 Oakville Merlot by Swanson from the Napa Valley was starting to lose its fruit in my opinion; however I had initially been lured by the prospect of drinking some different wines and this certainly delivered. 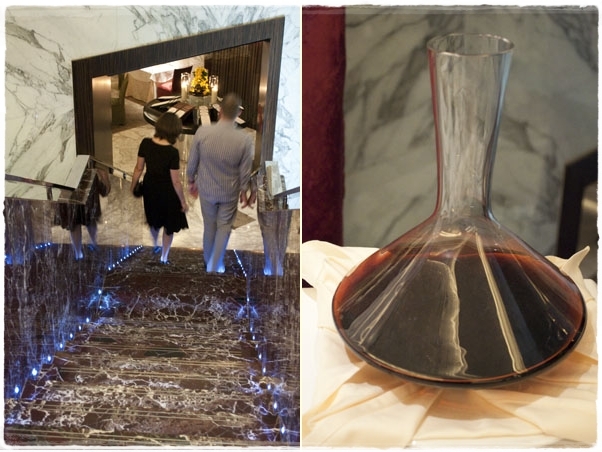 Interestingly, I couldn’t see these on the main wine list either meaning they were hand-picked for the evening by Bernd – it was a real treat to step outside the usual suspects on Dubai wine lists. 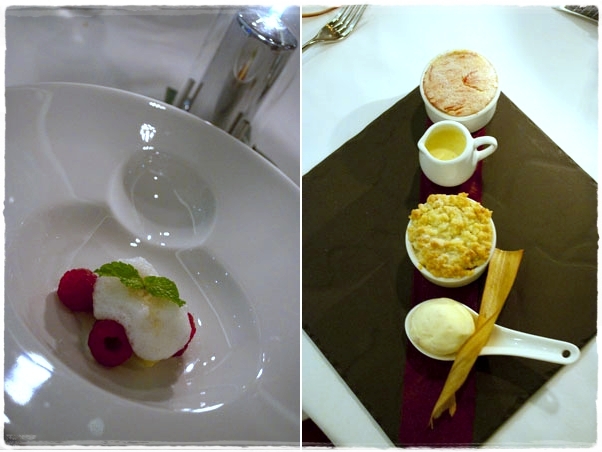 A jumble of mango, raspberries and mint in a lime foam was a lovely surprise and revived our flagging appetites for a trio of rhubarb desserts (served with – deep joy – a jug of custard); ice cream, a crumble and a pillow of soufflé, the latter being another triumph. A Chilean late harvest Gewurtztraminer by Montes was a lovely choice of dessert wine however we sneaked back to the GB bubbles, the fruity freshness getting on very well with the rhubarb. The chef emerged from the kitchen and revealed he was British with stints in Dubai at Verre, The Ivy and Rivington Grill. His name eludes me, and that of the lovely server who joined in with our rather boisterous debates about the food and wine, as does the scrap of paper where I made notes of them. I was just enjoying myself too much. 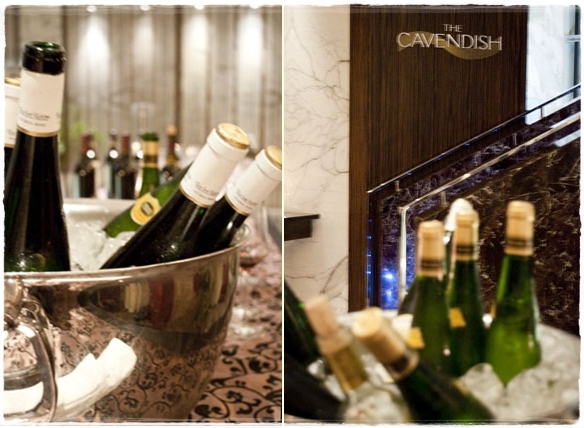 Only pressure of work stopped me from writing this up immediately, in the meantime I have been telling everyone I know about The Cavendish monthly wine dinners with seasonal menus. 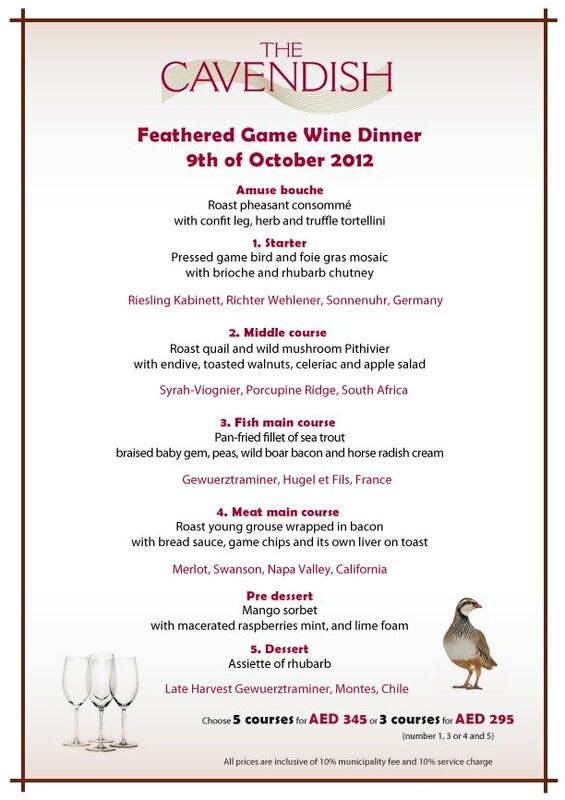 Only the prospect of seeing my two daughters at the school concert (one on clarinet, one singing Rule Britannia) prevents me from returning on Tuesday 13th November 2012 for the Furred Game Wine Dinner (menu here). With 3 courses for 295 AED and 5 courses for 345 AED, which includes some really interesting wine matches, this is exceptional value. We left via Healey’s Bar and Terrace where a lively jazz band was in full flow, and then onto McGettingan’s, a phenomenally popular Irish Pub still bustling even though it was almost midnight on a Tuesday evening. How the other half live in Dubai!. Any food and wine matching highlights to share? And are you game for game? Or should we ban the bunny? What a fabulous meal! Like you, I am game for game and love to eat rabbit. Thanks Rosa – wild rabbit is a fantastic meat (however farmed rabbit leaves a lot to be desired in taste and welfare conditions I’ve discovered). Are you a restaurant clinic or have you become interested in this through the blog? Not sure I understand your question Bakingbeardy! Thanks for commenting. Sounds like an amazing meal! All the dishes look very elegant, and the care and involvement of the staff are fabulous – so often that sort of thing is missing in large establishments. I adore game, but can’t usually talk Pete into joining me – he doesn’t like the flavours. Service is generally good here in Dubai but it is often quite uninformed – the quality of the understanding of the staff really made the difference here. KP would join Pete in the non-game corner! What a lovely evening &dining & wining you must have had, dear Sally! 🙂 What a lovely experience for you ! The dishes look elegant & ooh so appetizing too & by the way: I love rabbit. There are a few tasty rabbit dishes in our Belgian cuisine, especially in wintertime! I also love game & it is game season over here too! We love it so much! i’m a big game fan, but it took me a while to try rabbit. It kind of straddles the pet/food boundary. Now I love it though. Sounds divine – you have inspired us to try the menu on the 13th! yummmy. Love to hear what you think of it. Enjoy. I love game! Just no rabbit, when I was a small girl we went to dinner at my aunts and they said I was eating chicken, I loved it so filled my belly and afterwords they told me “you’ve eaten a bunny!” so okay… trauma 🙂 So ever since I can’t eat rabbit! So silly I know! I’m game for game! 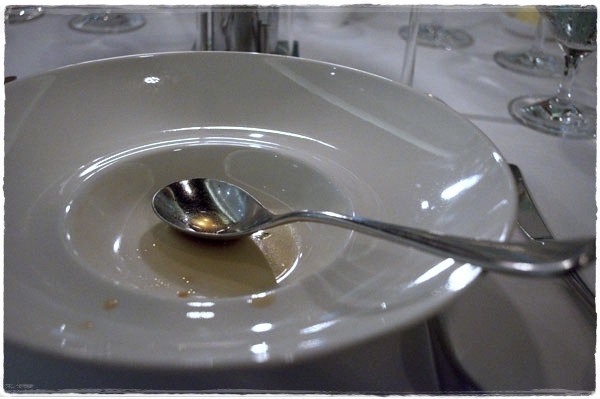 And though I love the entree, its the desserts that had me salivating – lime foam? Bring it on!! !